THE GUILD OF CORNISH HEDGERS was established in 2002 in response to critical decline in the ancient craft of Cornish hedging. Most of the remaining traditional hedgers were coming towards the end of their active life and were deeply concerned about the poor standard of workmanship in hedging today. 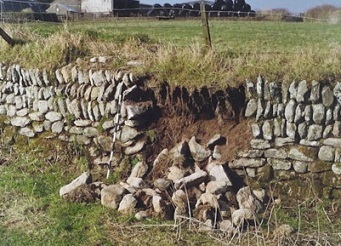 The frequent collapse of recently-built hedges, sometimes within weeks of completion, was giving Cornish hedges a bad name and leading to hedge removal and lack of demand for new hedges. 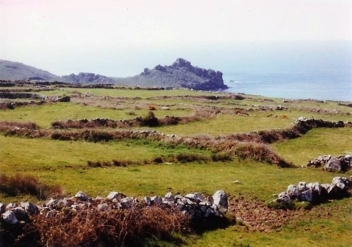 The Guild's Founder was Robin Menneer, the son of a Cornish farming family whose professional career with MAFF had included setting up the West Penwith Environmentally Sensitive Area. 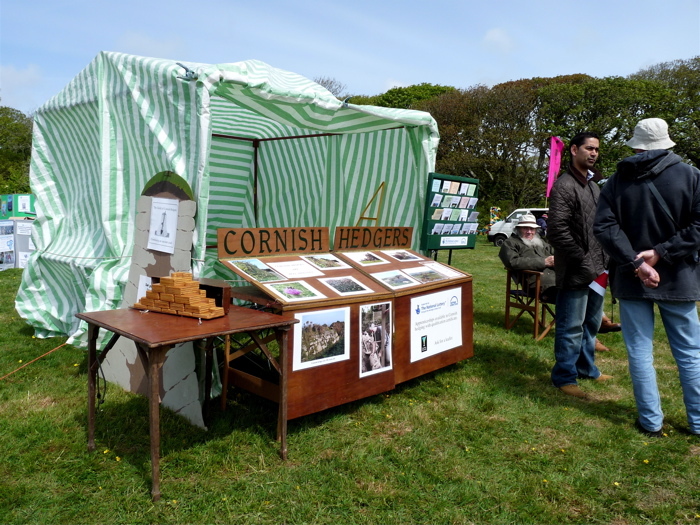 He devoted his retirement years to raising public awareness of the value of good Cornish hedges, and promoting the Guild's work in training a new generation of skilled craftsman hedgers. He gathered a consensus of information from the few remaining master hedgers and set the Guild's standard Code of Good Practice for Cornish Hedging. A good craftsman who builds to the Code can guarantee that his hedge will stand for 100 years before it may need repair. Robin also devised the innovative Hedge & Wall Importance Test, a method of surveying any type of hedge, hedgerow or wall for its historical, landscape and wildlife value. Unlike other lengthy and invasive survey methods, the HIT can be completed in a short time by simply walking along a few feet away from the hedge, without fear of disturbing wildlife or injury to the surveyor. Entered online, the HIT produces a printed description accurately giving the importance of the hedge or wall. The HIT is hosted by the Environmental Records Centre for Cornwall and the Isles of Scilly, in collaboration with the Guild. 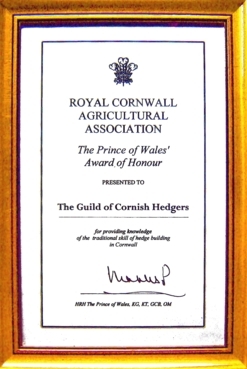 In 2007 the Guild became the first winner of the Duke of Cornwall's Award of Honour under the aegis of the Royal Cornwall Agricultural Association, for promoting knowledge of the traditional craft of hedge-building in Cornwall. The Guild is a self-sustaining, non-profit-making organisation run by the Craftsmen, with two Stewards elected by them to carry out the day-to-day administration. The Friends of the Guild are members of the public or corporate bodies who enjoy Cornwall's hedges and are keen to see them looked after. The Friends' modest entry fee helps towards the overheads of maintaining the Guild. 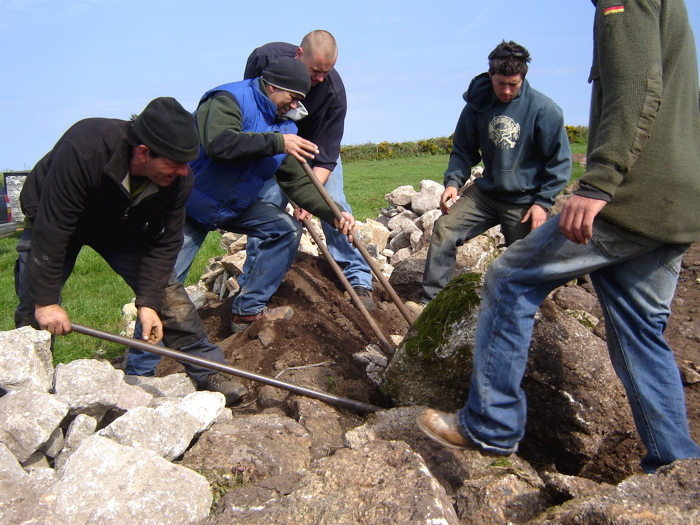 The Guild has been fortunate in receiving grant aid from Rural Progress, the AONB and the Heritage Lottery Fund, all of which has been used to full effect in training new hedgers and promoting education about the history, landscape and wildlife value of Cornwall's unique hedges. The Heritage Lottery funded apprentice training scheme has been running successfully since 2007. Currently in 2019 there are still a number of places available. In 2013 Robin was made a Bard of the Cornish Gorsedd in recognition of his work for Cornwall's heritage of historic hedges. He died in 2018 aged 85. His legacy is the work the Guild of Cornish Hedgers carries forward in continuing to promote knowledge and train competent new hedgers. To apply for a place on the Guild's Apprentice Training Scheme, or to become a supporting Friend of the Guild, please go to www.cornishhedgers.org, or call the Guild's Stewards on 01736 788 816. The main attraction of the Cornish landscape is the pattern of small fields enclosed by hedgebanks, usually made of or faced with stone gathered locally. These hedges are our largest semi-natural wildlife habitat, providing a variety of conditions which elsewhere occur only in a wide range of different habitats. There are about 30,000 miles of hedges in Cornwall today, and their development over the centuries is preserved in their structure. The first Cornish hedges enclosed land for cereal crops during the Neolithic Age (4,000 - 6,000 years ago). Prehistoric farms were of about 5 - 10 hectares, with fields about 0.1 ha for hand cultivation. Bronze Age hedges near Gurnard's Head. Some hedges date from the Bronze and Iron Ages, 2000 - 4000 years ago, when Cornwall's traditional pattern of landscape became established. Others were built during Mediæval field rationalisations; more originated in the tin-and-copper industrial boom of the 18th and 19th centuries, when heaths and uplands were enclosed. 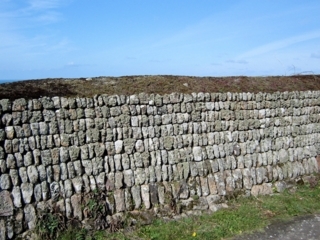 This history and the county's geological form make Cornwall's hedges different. In other parts of Britain early hedges were destroyed to make way for the manorial open-field system. Many were replaced after the Enclosure Acts, removed again in today's quest for cheap food, and now some are being replanted for wildlife. Cornwall is richer in historic hedges, with over three-quarters of the hedges remaining today being anciently established. Cornish hedge in need of expert repair. These hedges need looking after. Even well-built hedges suffer effects of tree roots, burrowing rabbits, rain, wind, farm animals and people. 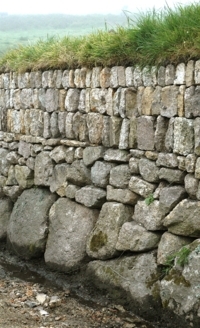 Eventually, the hedge sides lose their batter, bulge outwards and stones fall. How often repairs are needed depends on how well the hedge was built, its stone and what has happened to it since it was last repaired. Typically a hedge needs a cycle of repair every 150 years or so, or less often if it is fenced. There is demand for new Cornish hedges. Building new, and repairing existing hedges is a skilled craft. 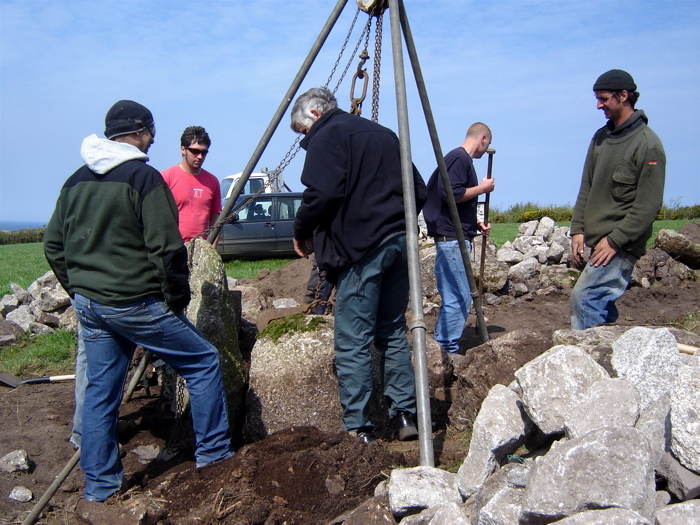 There are skilled professional hedgers in Cornwall who are relied on to do a proper job, but there are others who lack correct training and who are pressured to do sub-standard work. Good training needs to be available for serious young hedgers. Also many people enjoy the therapeutic value of working on Cornish hedges and want to do a proper job, but need expert supervision. 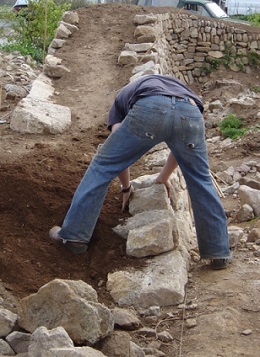 For anyone wishing to look after their own hedges the Guild runs a two-day course in repairing gaps in the stonework. 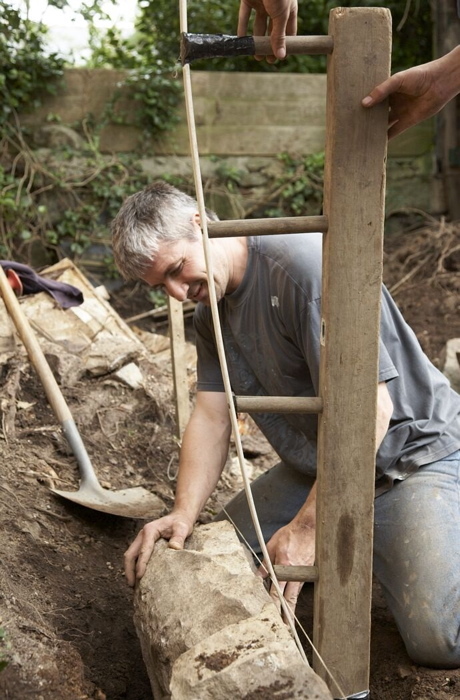 By supporting the Guild of Cornish Hedgers, we trust that this ancient Cornish craft will continue into the future, with new craftsmen coming forward to look after Cornwall's heritage of hedges. 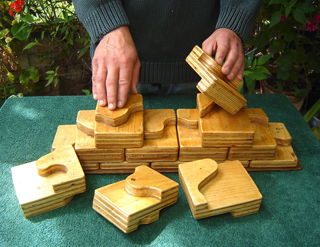 Aptitude test devised by Guild Founder Robin Menneer accurately gauges the ability to fit shapes together, showing whether the would-be hedger will have a good "eye for stone". Thanks largely to the work of the Guild coming when the time was right, there is now a growing demand for new Cornish hedges. 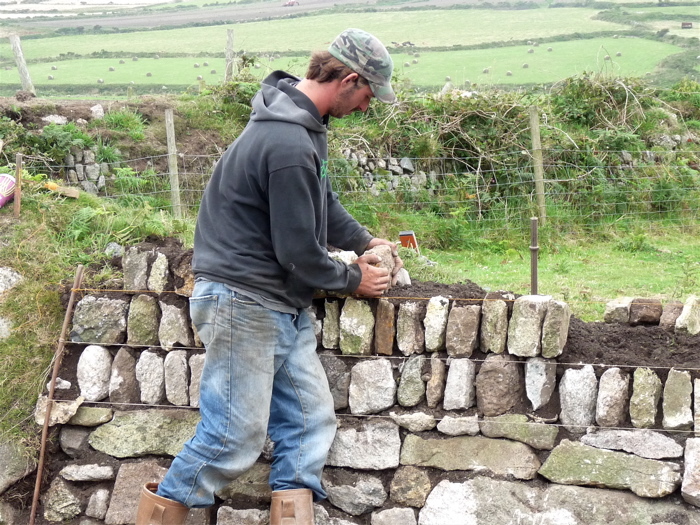 The Guild's apprentice scheme presents an opportunity for anyone with the physical and mental ability to handle stone, the motivation to work often alone out of doors, an interest in the historical and environmental aspects of Cornish hedges, and a real intention to learn and practice this traditional craftsman's skill as a professional Cornish hedger. 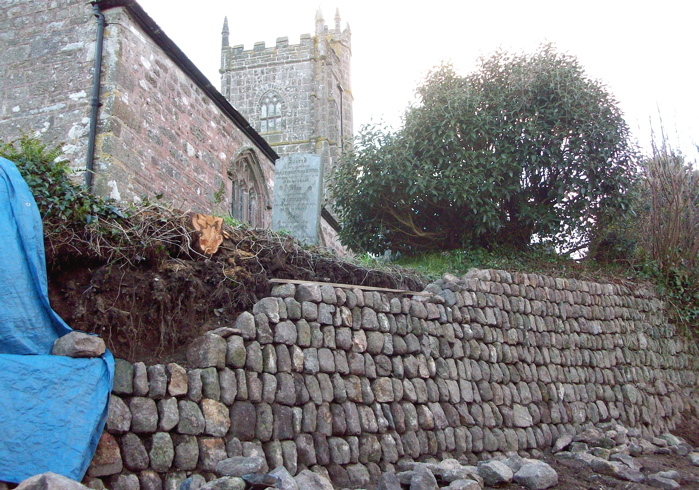 Guild-trained hedger building a Cornish hedge. The scheme comprises a ten-day course of hands-on training under the instruction of a qualified Guild hedger, followed by the Preliminary Hedging Test. If this is passed to the standard required by the Guild at this stage, it is followed by 40 working days of work experience and improvement on the trainee's own initiative, under visiting supervision. When the 40 days are successfully accomplished, the trainee is eligible to take the final Practical Hedging Test. This carries the Guild's Craftsman certificate, and is the only qualification in Cornish hedging that is approved and certificated by Lantra. The Heritage Lottery Fund bursary of £1500 in total is payable to the trainee in instalments subject to satisfactory progress. In time the qualified Craftsman may work towards attaining Master Craftsman status by satisfying the Guild's highest standards. Hedge built by Guild trainee during his individual 40-day practice time. A breezy day with the Guild's tent at a local event. Robin designed and made the folding display stand for compact storage and ease of handling. It suits the Guild's modest, workmanlike ethos. Trainees on the 10-day course setting a big grounder in place. Guild steward Patrick Semmens teaching use of the tripod to move large grounders. 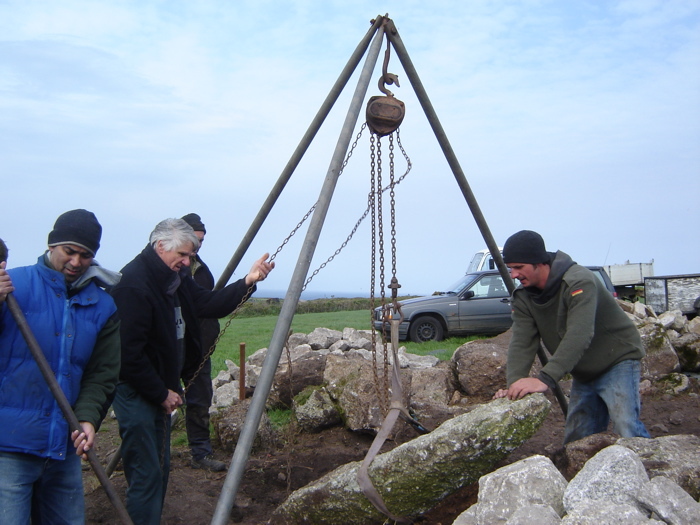 Using the tripod in the traditional way to raise a granite gatepost. 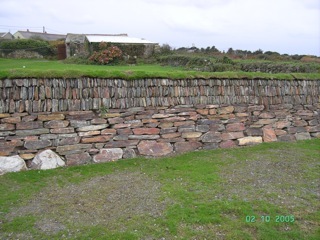 A retaining hedge built by a Guild apprentice as individual practice during his 40-day training period. Taking the final Practical Hedging Test to become a qualified Craftsman of the Guild. 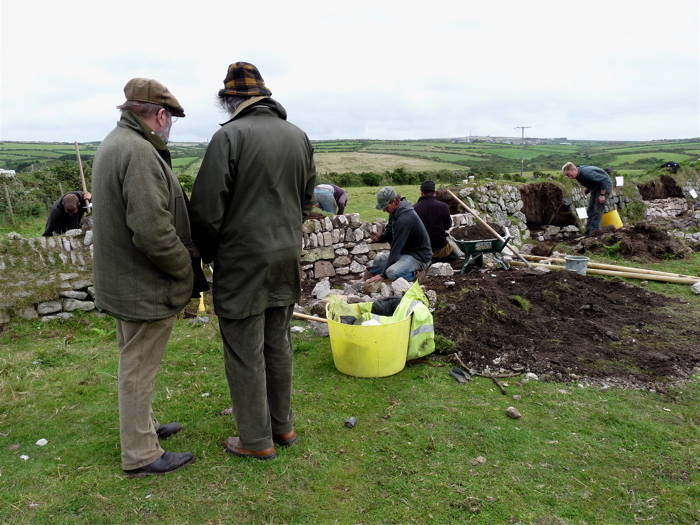 Cornish comedian Jethro (left) and Guild founder Robin Menneer watching a Practical Hedging Test in progress, July 2009. 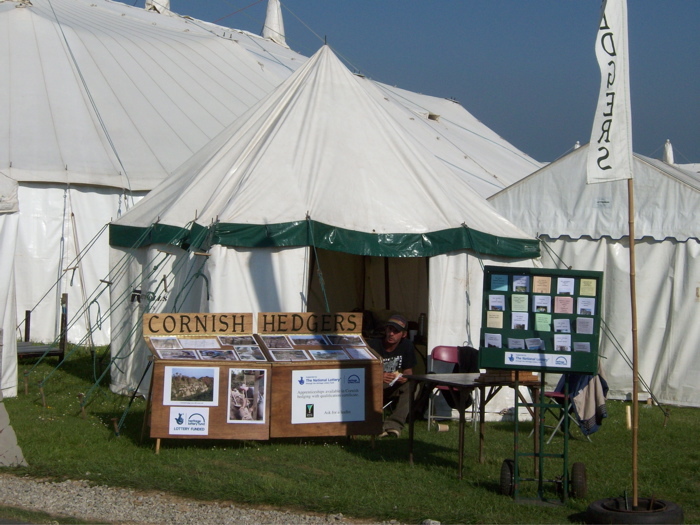 The Guild of Cornish Hedgers' stand at the annual Royal Cornwall Show.